Now this is a great idea. We have absolutely no idea what Disney's Toy Story-themed Shanghai hotel will look like on the inside, but we're seriously hoping for a toy's-eye view experience. The Disney Insider Blog has revealed the official concept art from a Toy Story Hotel that will be built in the new Disney Shanghai resort. The exterior mimics the classic wallpaper from Andy's bedroom, and right in the center of the entrance is the classic Pixar ball. 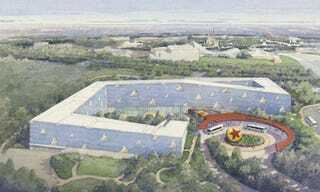 Not much else was revealed at the website; the only official details we have is this art and this statement, "The Resort's Toy Story Hotel will transport guests to a world inspired by the toys from the Disney/Pixar series of Toy Story animated films." So it could be just about anything, but we're crossing our fingers for a hotel that's built from the POV of a toy. Imagine guests climbing in gigantic chairs, walking under massive table legs, life-size toys sitting up against the walls. It could be a lot of fun. More details about the upcoming Shanghai resort at The Disney Insider.